We’ve all seen them, those word cloud images that seem to be so much fun, and most of us have used them. That’s no surprise. Genealogists tend to be in love with words, and The Legal Genealogist is no exception. Tagul may be the least known of the word cloud services, but one that offers a great deal of functionality. You can create or use custom shapes (think family trees here) as well. 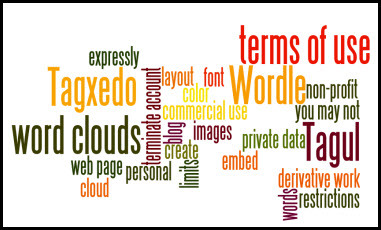 • No bad words (“abuse words” in Tagul parlance) can be used in cloud. • Clouds can’t be on web pages with objectionable content (“pornographic, hate-related or otherwise violent content”). • You’re not allowed to use clouds on your web page or blog that are created by others. The days of Lucy, Linus and Charlie Brown making comments about clouds are over I suppose. Linus and Lucy must have been the founders of modern day clouding. I am like Charlie Brown, still thinking I see duckies and horses. So much is smoke and mirrors today, I spend a lot of time learning to use tagxedo only to find that one can’t really do much with the image except stick it on your fridge. Present it as free and then charge as much as $800 (tagxedo). Thanks.